Join award-winning California based photographer, Charles Needle, in this special one-day hands-on workshop where you'll learn new creative techniques to craft unusual, striking images and take your close-up photography to the next level. Our speaker is an award-winning, California-based fine art photographer, author, speaker and workshop leader with a unique eye for design and artistic interpretation. His popular 'Art of Nature' creative macro workshops have attracted students nationwide. A popular speaker at NECCC conferences his lectures are always entertaining and educational. Part 1: The workshop will begin with an advanced two-hour instructional lecture on creative macro/close up photography. 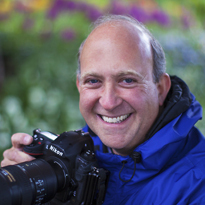 Topics covered will include: selective-focus macro, "shooting through" with a telephoto lens, close-up lenses/diopters, macro with specialty lenses such as Lensbaby and Taleidoscope lenses, and wide-angle macro. Everything you need to know to take advantage of the set-ups and shooting workshop to follow. Part 2: Work with Charles as his helpers as he gives shooting demos of the set ups available for you to use. You will have plenty of time to photograph in an indoor "studio" with various set-ups involving colored, iridescent and clear textured glass, Mylar, glass objects, shells, etc. There will also be colorful backgrounds, fresh-cut flowers, silk flowers, and plenty of other objects to shoot. You'll feel like a kid in a macro candy store. There will be a short break for lunch. Lunch not included in the workshop cost. There are various fast food restaurants in the area or you can bring a sandwich with you. Part 1: 9-10:30 AM – Part one of the workshop will be a presentation that will take you back to one of the basics needed for photography- Lenses. Which lens is best to achieve that optimal image that you see in your head when out shooting? Do I need primes or zooms-fixed aperture or variable-camera maker or third party. While it is true that the photographer makes the photo, not the equipment, having the right lenses and knowing how to use them is an essential part of being a photographer. The workshop will go over the basic characteristics of lenses and provide pointers on selecting the best ‘kit’ that fits within your photography budget. Greater Lynn members familiar with the different makes and models of cameras and lenses will have available a variety of lenses from super telephoto to ultra wide angle which you will be able to try out, review and ask questions to assist you in finding a lens suitable for your area of interest. If you do not have a camera with interchangeable lenses (DSLR or Mirrorless) you will still be able to benefit from the workshop by knowing what will be possible with a more sophisticated system when you purchase one and you will not buy or spend money on the wrong lens. The fee for the workshop is $30.00 for GLPA members and $40 for non-members. Program Notes (43 color pages) will be emailed in PDF format once your workshop payment is received.